Warmer weather calls for colder dessert. 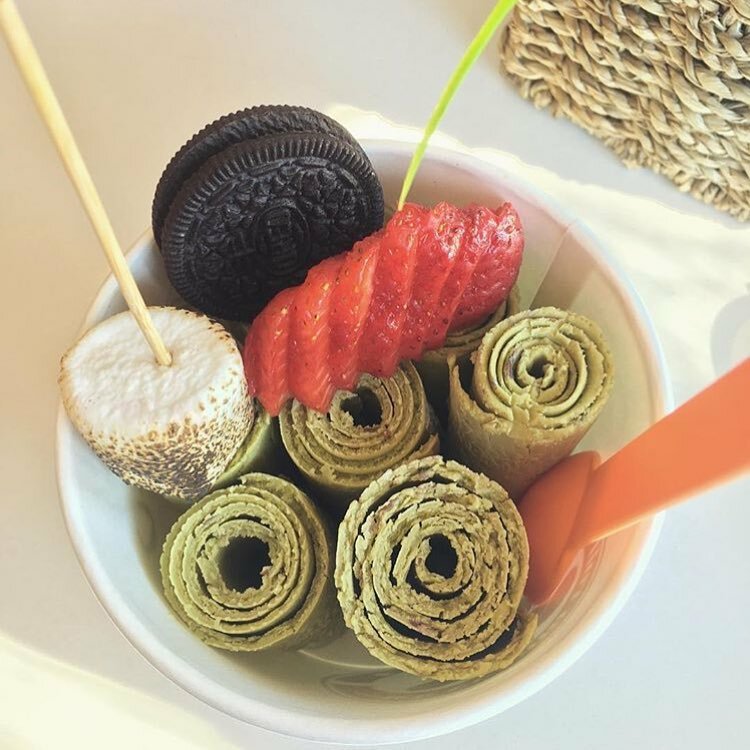 From Thailand to Boston, rolled ice cream is a must try dessert that gives a new texture to an old favorite. Here are three great local cafes where you can treat yourself. Rolled ice cream is our sweetest new obsession. First popularized as a traditional street food in Thailand, the treat is exactly what it sounds like: ice cream is mixed with fruit or different ingredients then spread thin across a pan cooled to -30°. From there, it's curled in on itself to roughly the size of a roll of quarters. A fun and novel way to enjoy ice cream on a hot summer day, this ice cream trend is rolling into Boston at these three cafe's. A small trendy shop on Brighton Avenue, Hi B3ar credits itself as one of the first to introduce the ice cream roll to Boston. 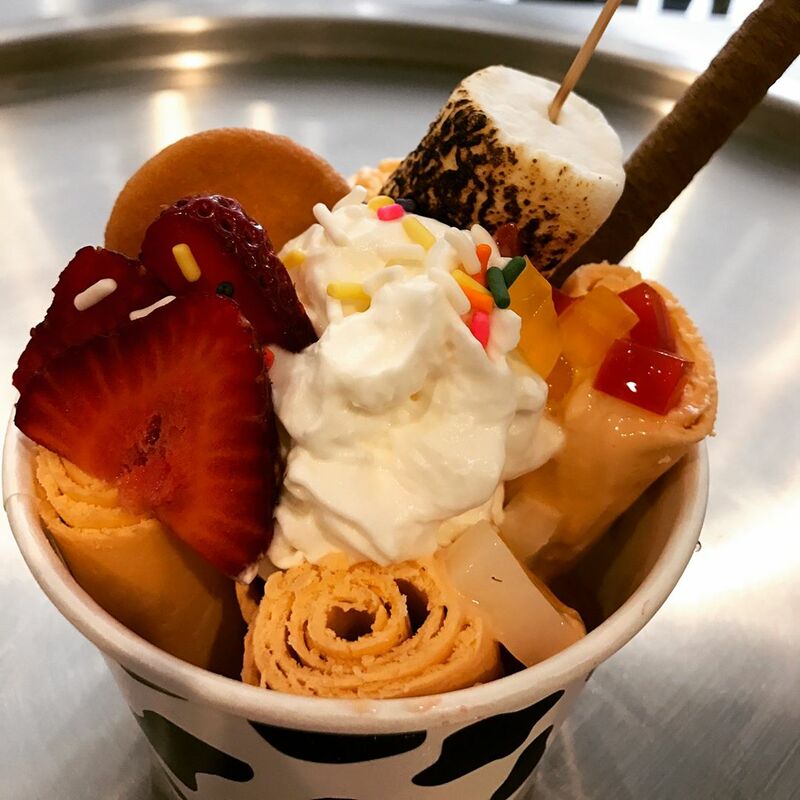 Although there may be a long line and limited seating, the experience will be worth the wait, when an ice cream roll chef makes your order in front of your eyes – both fascinating and satisfying. Hi B3ar has ten flavors to choose from such as key lime pie, oreo and mango. But for us, it was definitely love at first sight with our "First Kiss" – an ice cream roll packed with strawberries and graham crackers, on top of which we loaded fresh strawberries, chocolate chips and a freshly toasted marshmallow. 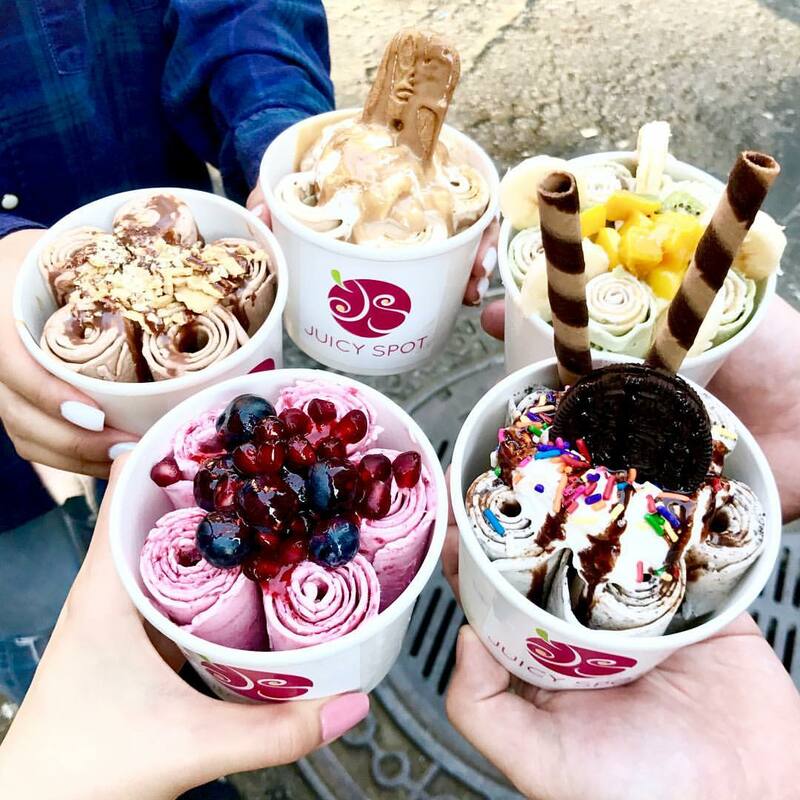 Each cup comes with seven rolls and unlimited toppings such as popping bobas, strawberry jelly, blueberries, pineapple, gummy bears, almonds and Pocky. Located near the Chinatown Gate, Juicy Spot Cafe is the only shop in Downtown Boston serving this innovative ice cream. With two locations in New York, Juicy was one of the first to debut the delightful dessert to the United States netting it a featured spot on the Cooking Channel. Juicy's show-stopper is the "Razzle Dazzle" – a raspberry yogurt base topped with an alluring combination of blueberry, pomegranate and raspberry drizzle. It's a dangerous temptation for any raspberry –or fruit– lover. And another of Juicy Spot's offerings that's making a lot of noise is the "Fire Cracker"— bursting with pop rock candy, it's the perfect ice cream to celebrate the sunshine. Make sure you bring cash – they only accept credit card for orders over ten dollars. Another Allston joint we love is NextDoor Cafe — with its painted wings on the wall and exposed brick, the cafe is a playful place to get your ice cream on. There's plenty of seating, which makes NextDoor Cafe a great dessert spot for friends or significant others. With an extensive menu of ice cream rolls and toppings, our favorite is the "Lychee Sweet." The little fruit that has a light sweet-tart taste and pairs well with the coconut — a tropical combination that won't disappoint. Oh, and it gets better: NextDoor Cafe has taken their rolled ice cream a step further with the taco ice cream. 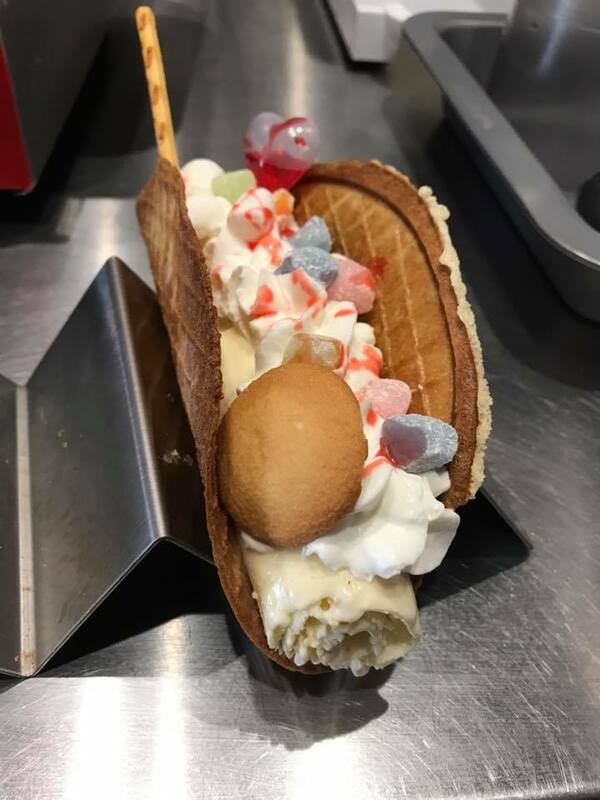 Rolled ice cream is placed in a crispy waffle "taco" shell and topped with liquid nitrogen. While we're not saying that you can't have ice cream for dinner, if you are also craving savory eats, NextDoor also has you covered with their waffle fries, fried pork gyozas and deep-fried pork cutlets. Eat up!